XR220, one of only two remaining TSR2 airframes, sat outside at RAF Cosford. The aircraft was on static display at the RAF Cosford Air Show 2015 to mark the 50th anniversary of the project's cancellation. Image taken from a helicopter as part of an official photoflight. The British Aircraft Corporation TSR2 was a cancelled Cold War strike and reconnaissance aircraft developed by the British Aircraft Corporation for the Royal Air Force. 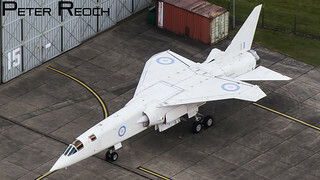 The TSR2 was the victim of ever-rising costs and inter-service squabbling over Britain's future defence needs, which led to the controversial decision to scrap the programme in 1965.